Feel Relaxed, Balanced and in Harmony with the YOUniverse. A practical guide for living your life in accordance with the Zen philosophy. Understand the self and the world; be aware of your own actions and the reasons behind them. Know the Four Noble Truths and see the world as it really is. It is the realization that everything (even the self) changes and that clinging to the idea of a permanent self is an illusion and gives rise to unhappiness. Be sure about what controls your actions. Are they for the good of all or just yourself ? Resist to acting upon feelings of desire, prejudgment or aggression. Remember that words are never ‘just words’. Words can make or break lives. You must be careful with the things you say. Don’t tell deliberate lies or speak deceitfully. Avoid using harsh words that offend or hurt others. Speak friendly and only if you have something positive to contribute. This one is simple: Don’t do wrong ! It is to keep from harming or even killing people (or animals). Do not steal or (sexually) misuse others. 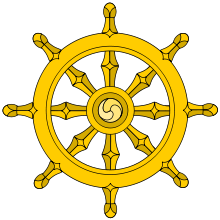 The Dharma wheel is often used to represent the Noble Eightfold Path. Live an honest life by doing a job that will help mankind instead of being harmful or just for the purpose of getting rich. Effort is the driving force for the other aspects of the Eightfold path of Zen. Without the right effort nothing can be accomplished. It means to refrain from helping or starting things that can cause harm. And to actively help where good can be done. Is the ability to have a look at yourself from a distance. Observe your body, feelings and mind without attraction or diversion. Keep an open mind in the present, quiet and alert. Focus on present events. Do not judge or interpret. The way to reach complete concentration in Zen is through Zazen (meditation). But this is only the exercise to learn how to achieve one-pointedness of mind. It is something that the Zennist must try to maintain in everything he or she does or says.